Violet is a fictional superhero character on Disney’s movie The Incredibles. She is the daughter of Bob Parr aka Mr. Incredible and Helen Parr aka Elastigirl, and has 2 brothers; Jack Jack and Dash who all have superhero abilities. Violet’s super powers is her ability to render force fields, turn herself invisible and manipulate objects around her. This is a fun costume idea of girls and women to dress up as for Halloween. 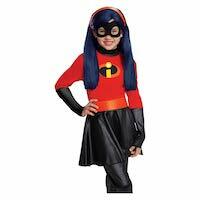 Find Violet Incredibles costume ideas below. Violet never goes on a mission without her high tech super-suit, and since this costume is officially licensed, your little girl will have the right gear, too! This synthetic jumpsuit is printed to look just like the suits in the movie, and even includes a matching eye mask. 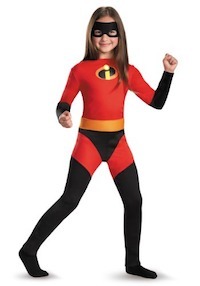 Add a pair of black superhero gloves and boots to complete this look, and have the rest of the family dress up as The Incredibles for a super-family Halloween costume that’s way more fun than having real powers! 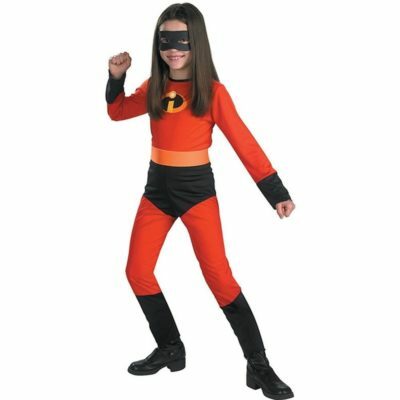 Click here to get the Toddler Incredibles 2 Violet Classic Costume. This adorable little jumpsuit is super simple with attached black boots and gauntlets. Your child might not have invisibility skills but she’ll feel sneaky when she’s wearing the mask. And there’s no need for her to go fight crime along. 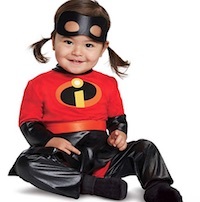 This is another option to dress up your infant in an Incredibles 2 Violet costume. Just be careful you keep on an eye on her because she might use her super powers and become invisible. This is a pullover dress that has a hook and loop fastener on the back. The eye mask has an elastic band and is included in the costume. 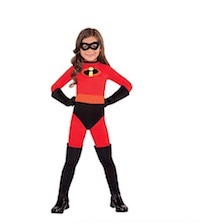 Click here to get Violet Incredible 2 Costume for intants. Now with these licensed sunglasses from The Incredibles movie, you can get eyewear that helps protect your eyes from the sun, while allowing you to keep your look as a savvy superhero.The Incredibles Sunglasses are a quick and easy way to transform into one of the many members of the superhero family. 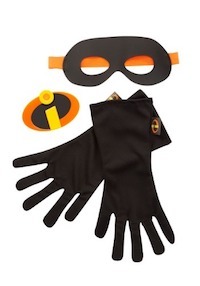 Fortunately, there is this Incredibles 2Costume Gear Set around to help you go from superhero to superb-hero! Begin with the Incredibles patch insignia and stay connected with the rest of your team. Add in black gloves with the same iconic I. Black mask for identity protection? Not enough! Add in a flashy elastic band and it is marvelous! 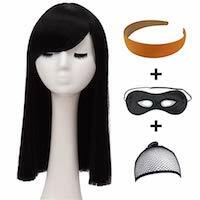 Make sure you get Violet’s long black hair and accessories set to complete your Incredibles look. This is just the wig for Violet in Incredibles. The costume is not included. Make sure you buy the costume separately to complete your look. This long hair would like great with your Violet Incredibles costume. Click here to get Violet Incredibles 2 Wig. 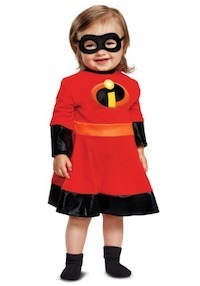 Her super powers allow Violet to become invisible, but you certainly won’t be in this Kids Violet Incredible Costume! Add boots and gloves to this costume for the complete superhero experience. And do your best to act normal! The Incredibles are back! 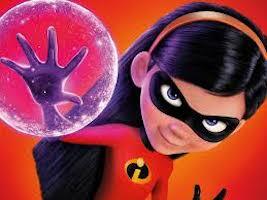 violet Parr is the eldest child and only daughter of Bob and Helen Parr and older sister of Dash and jack-jack. She can make herself partly or completely invisible or create a force field around herself or in some distance. This fully articulated violet costumed action figure stands 11 inches tall. Feutures a removable face mask and highly detailed fabric fashion costume making her ready to take on whatever Super villian comes her way! 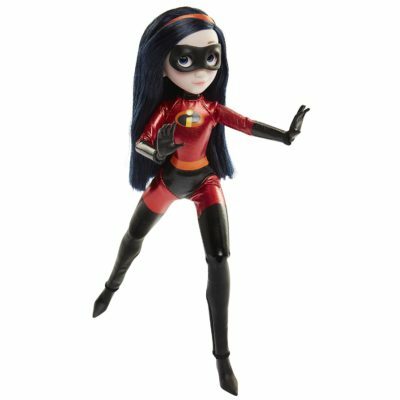 Click here to get the Violet Incredibles Doll. 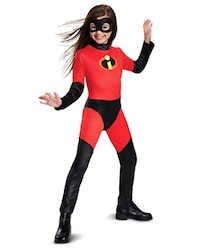 This costume is the character Violet from the Disney Pixar Incredibles movies. It includes a jumpsuit, detachable belt, sound chip, skirt, and eye mask. The jumpsuit is red and black. On the chest is the colorful Incredibles logo. You can press the belt to use action sound effects! The sound chip comes with an LR 1130 (AG10) button cell battery. 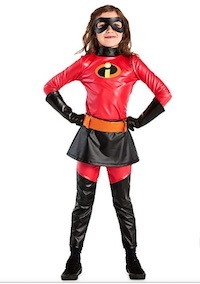 Your little girl can now be her favorite Disney superhero with our Incredibles Violet costume. This cute girl’s costume features a stretch jumpsuit with the “I” logo in the center of the chest and black gloves to complete the costume. 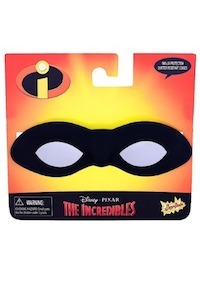 To conceal her identity from Syndrome and any other possible villains, have your little one wear the elastic eye mask. This soft and stretchy jumpsuit comes in vibrant colors such as red, black and orange, so your neighbors and family members will remember your girl’s Disney inspired costume for years to come. 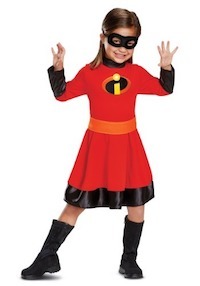 Click here to get Violet Incredible 2 Costume. This Kid’s Got Skills! It’s crazy how much trouble a kid that’s supposed to be a superhero can get into. Just imagine if your child could go invisible any time she wanted. Bathtime would simply have to be optional. There’s no way you could get a child with invisibility talents into a bathtub against her will. Then there’s the issue of snacking. You wouldn’t be able to unpack groceries safely without a packet of cookies going missing. You never see those cookies again because invisible children are awesome at hiding loot. Well, maybe you’re grateful you aren’t raising kids with superpowers. Keeping your kid from eating mostly cookies and decently bathed is hard enough as it is. Still, maybe you can try out a new family venture. The Parr family seems to make it work, we’re sure you can too! Product Details This adorable little jumpsuit is super simple with attached black boots and gauntlets. 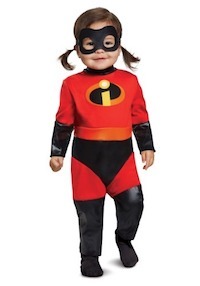 Click here to get the Baby Girls’ Incredibles 2 Violet Classic Costume.